Controlling your own selfie wasn't an option before photography. When he was on the run for murder, Caravaggio probs regretted painting his self-portrait. But there he is in Beyond Caravaggio at the National Gallery in London, holding a lantern over Judas as he betrays Jesus with a kiss in The Taking of Christ, a masterpiece that fell into obscurity for a few centuries, much like Caravaggio's fame. Derek Jarman's film Caravaggio is a violent love story starring Tilda Swinton, before she grew up to be David Bowie. Swinton plays that familiar virgin-whore icon everyone's mom warns them about. The division of good and evil, self and twin, me and you, appears to be distinct yet is as ambiguous as a blurred selfie. By using prostitutes to model as saints, committing murder, and dying mysteriously, Caravaggio played the role of artist as rock star. Picasso's Portraits at the National Portrait Gallery in London is a cast of weeping women bled dry by the vampiric painter, at least in this visually complex version of his story. 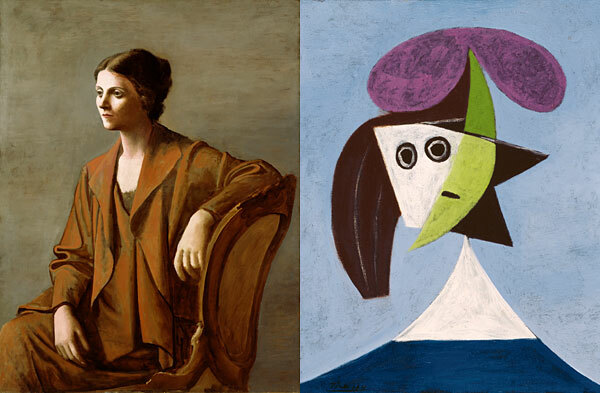 Did Picasso attract sad women? Did he make them cry? Or is melancholic just the way his artist's eye sees them? Fernande Olivier (who shared his starving-artist days when Pablo still managed to stay on the wrong side of porky), Françoise Gilot (the only one who dumped him), and his last wife Jacqueline have the same Virgin Mary hairstyle and woeful expression. His beautiful ballerina wife Olga is celebrated on canvas — until their bad break-up, when he hacks her face into Cubist bits. But there are photographs of her to show us what she really looked like. My photogenic frenemy, who gets lots of blind dates with men who don't stay for dessert, looks like Louise Brooks in pictures and more Richard the Third IRL. In pictures I'm more psychotic boy scout than femme fatale but, as Mr. Lash insists, pure gorgeous IRL. I haven't looked in the mirror since eating an entire bag of crisps, so I'll take his word for it. When I discovered that my ex-stalker fan has been distributing distorted-lens shots of me posing onstage as my evil twin, I was tempted to take some selfies to prove that I'm not a minger. But then I went out without my phone. That pang I feel when I forget to wear my Tiffany bracelet was absent as I rummaged in my vintage Bao and wondered if I had lost the Beijing platinum phone or left it behind, with messages from secret admirers unprotected on the screen. Enjoying the absence of beeps, the silence broken only by the click-click of my Louboutins, the idea of digital suicide came to me on the road to Selfridges. But what will I miss? A new death threat from my mom? A self-destruct snap of my faux boyfriend's bum? The opportunity to selfie myself in the hairdresser's scary mirror? The beauty of an evil twin is having someone to scapegoat. She can try digital death first. If she goes to hell and meets lots of interesting people with no camera phones, I'll join her. I love you all, but bear in mind I'm two-faced.